150° rotation, 32” dump height, 24” reach. Designed for drums 19” to 23 •••” diameter x 32” to 38” tall. Lift & Seal System™ hydraulically seals drum to an electro-polished 316 stainless steel cone. Washdown duty tubular carbon steel frame with continuous welds for easy cleaning. Exclusive twin cylinder pivot carriage design for smooth, controlled operation. 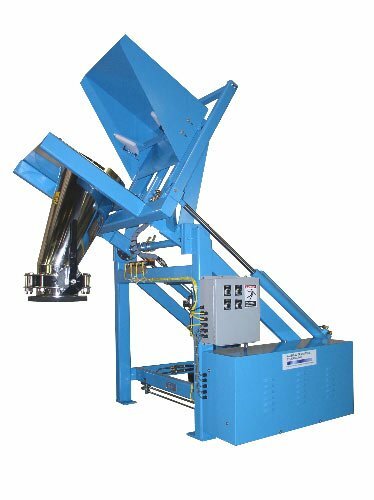 Loading skip includes adjustable drum locator to properly align drums to the pour cone. 10” diameter manual butterfly valve with discharge nozzle for dust-tight sealing to existing tank inlet flange. NEMA 4 rated electricals with 24 vdc controls. Pumping unit housed in an enclosure with bolt-on access cover for easy cleaning. 3 GPM pumping unit with MTS exclusive two-speed hydraulic circuit delivers precise control and reduced equipment cycle times.